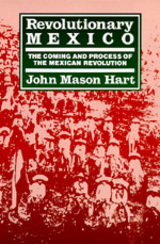 This acclaimed reinterpretation of the Mexican Revolution, based on new evidence obtained in Mexican and American archives and on the historical literature of recent years, is available here in the tenth anniversary edition, complete with a new Preface by the author. John Mason Hart is Professor of History at the University of Houston. His previous books include Revolutionary Mexico: The Coming and Process of the Mexican Revolution, Tenth Anniversary edition (California 1998).